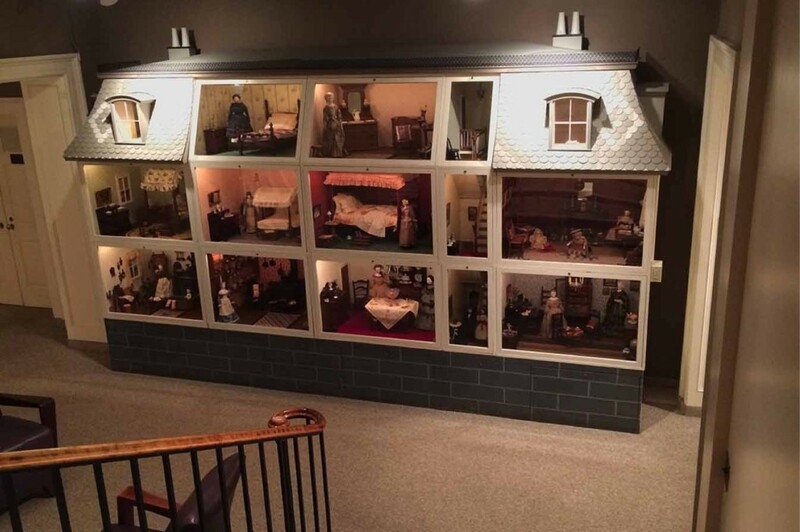 Built for the Lyman Allyn Art Museum in 1962 by Harold Hawthorne, the American Victorian Dollhouse was designed to house part of the museum’s toy collection donated by Lydia Sachs Baratz. The exterior of the dollhouse was designed to reflect the Victorian tastes of its doll inhabitants with a mansard roof, dormer windows, and a widow’s walk encircling two chimneys. Three levels of the home’s interior are visible, complete with bedrooms, a dining room, a nursery, a sewing room, and two kitchens which showcase the extensive kitchen miniatures in the Baratz Collection. Along with the display of the Dollhouse and precious toys from our collection, we will be adding an exciting new experiential learning center to this level of the Museum. Focused on our youngest visitors, ages 3-10, the interactive activities for children will include hands-on play with toys, books, games and dolls from many cultures and many eras of history. Children will be encouraged to use their imaginations to touch, learn and create scenes and activities in the new neighborhood. We hope it will open new worlds for these young visitors, as they learn about community, history, diversity and the visual arts.